Do you ever think that the universe is trying to tell you something? I haven’t posted an entry in a while because I think the universe was doing just that. It all started last Friday. I told myself work from home and don’t risk going to work. I should’ve listened to myself, because that morning my car became totaled. It didn’t stop there either. That Sunday I got on a plane to go to Ohio and not only did I almost miss my flight out of Philadelphia, but once in Ohio my taxi driver didn’t even know where my hotel was. Coming home got even more interesting. Once I landed in Philadelphia I watched the plane next me catch fire. I eventually get in the terminal and after a little waiting got on a plane home. Did I cheat death? The universe did not want me travelling, and it won because I still don’t have a car. Before all this happened though, I have been making changes. I recently started to feel my possessions owned me and I didn’t own them. I decided to change that and now my vinyl collection has gotten a lot smaller. I started listing on eBay and as much as it is sad to see them go, it feels good. There are bigger things in mind and the ones that I keep have a bigger meaning to me. That brings me to Greg Laraigne. A musician from Switzerland I met at a show he played in Bethlehem, Pennsylvania years ago. A show I went to on a whim. It was Greg and Tim Vantol, two acoustic musicians that play a blend of punk and folk. The show included foot stomping, harmonica playing, and crowd participation. I was blown away and had to pick up albums by each artist. Greg only had an e.p. available featuring songs for an upcoming full length. After listening to the e.p., I wanted more, but I had to wait till now to fulfill my want. This album was supposed to be released years ago, but as life goes, things happen. Greg now lives in Canada and focuses on his tattooing more than his music playing. I thought the album was never coming out. It wasn’t until I stumbled on this beautifully shot video. It seemed that the album got its release. After researching, I found out a punk label in the Netherlands called Shield Recordings released the album on vinyl. That week I bought the album and eagerly waited. Once it arrived, I was in for a surprise. Not only did the songs I already have make the cut, but the album overall was well done. From the packaging to the production, this album was finally given its true justice. Greg’s lyrics focus mostly around heart broke, life, his home country, and self discovery. His music will have to you stomping your feet and clapping along. The music and lyric content is as true and real as it gets. Only armed with a harmonica and acoustic guitar, this album incorporates other instruments, but very subdued. Except for “Nothing Lasts Forever.” This song is a full band rock song dying to be played while driving the country roads. To this day, after all these years, “Broken & Old” is still one of the saddest songs I’ve heard. The tone and the harmonica makes you sit and reminisce. For me this song makes me think of two things and the second one is an off feeling. The first memory is just driving with the sun setting while this song is playing. While driving, the trees on the side of the road block out the setting sun, but you still feel the warmth of the sun shining in between them. This is more prominent in the autumn season and it is a relaxing feeling. A feeling that could send you asleep because it is that calming. The second memory is the memory of watching Adventures of Pete & Pete. The harmonica, when played right, just sends me down memory lane of early Nick shows and the autumn season. I guess you can say that was when life was simpler. And I sit down aimless and you’re not coming back. It can be said that the second part to “Broken & Old” is “The Goodbye Song”. A simple song with duel acoustic guitars that could send a baby asleep. For a guy fully tattooed and with a punk attitude, he knows how to play calming music. It isn’t until the end of the song that you hear the bass come through which adds an excellent accompaniment. Quiet yet powerful. “Singing the Night Away” is another song that is quiet but has a powerful execution. A perfect song for a rainy day or, if you will, imagine walking the streets of a small town. Upon your walk you see a street performer playing a song like this one. Towards the end of the album Greg throws in a song about his home city Geneva in Switzerland. “Geneva’s Burning” has a country music feel to it mixed with a punk attitude. Even if you don’t live in Geneva, or never been there, this song will have you stomping your foot and singing along. It is has a charm to it that can’t be ignored. Punk rock is our soul. The last song on the album, “Black and Grey Hero”, is a perfect ending to an album. It starts out with an acoustic guitar and keeps building up with every verse. It isn’t until the end when another guitar jumps in, then a mandolin, and finally the harmonica. It gives the album a final touch, and if we never hear another song from Greg, this album is a testament to his music career. This album’s packaging is top notch. 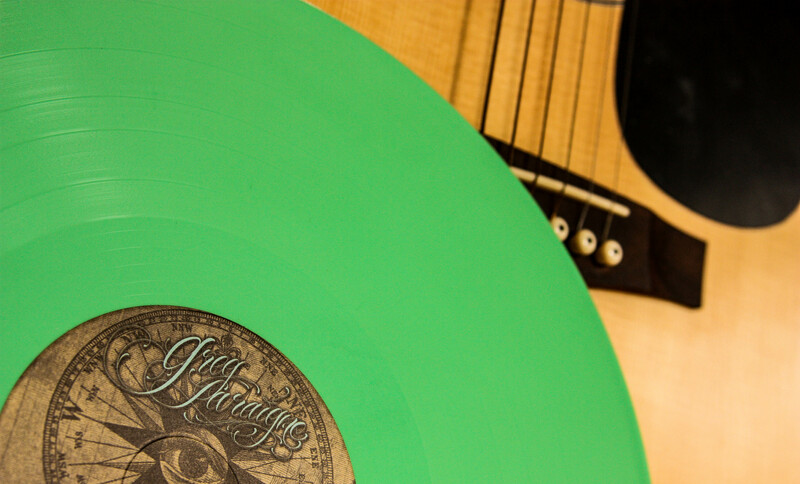 The packaging and lyric sheet is on hard stock paper and the vinyl is pressed on lime green 180 gram. Also it should be mentioned that it comes with the album on compact disc. Shield Recordings know how to put out records the right way. Besides that they know how to do “punk rock” mail order, tons of free stuff. I got over 10 inserts of album advertisements, stickers, and a free 7 inch record. I was surprised and grateful. If there is another album I like by this label I will not hesitate to order from them and pay the ridiculous international shipping fees. Now to look at cars and read E.E. Cummings.